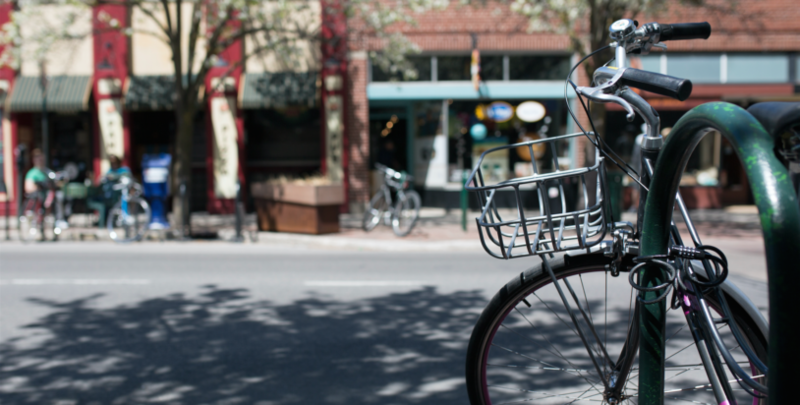 Biking to work may sound like a big commitment, but it doesn’t have to be. Ride once a week on nice days. Ride halfway if you live out of town. Start with a reasonable goal. We talked with Drew Tursma, a Traverse City resident and pediatrician at Grand Traverse Children’s Clinic, about why he started biking to work and tips for new bike commuters. Officially in April 2016. I used to off and on a few years ago and just got started again. I’ve driven maybe 12 or 13 times since then. I dived in. It’s a whole lot of f’s: fun, fitness, fresh air, fast, free. Biking reduces my stress, improves my mood, helps me think and the scenery is beautiful. Were you nervous when you first started? The biggest things I was unsure about were the weather and what to wear. I rode in the snow a couple times and the rain. I think the idea of getting caught off guard was what bothered me. Do you pack an emergency bag in case of a flat tire? I pack a change of shirt, and gloves are a must when it’s cold. I probably should pack a spare tire, but my route is all in town near gas stations and people. If I lived in the countryside I would definitely pack an emergency bag, though. How does biking affect your commute? I ride about 5.5 miles to work. It takes about 20 minutes on the way there, which is downhill, and 25 minutes on the way back. It only takes about 5 or 10 minutes longer than driving. Especially in the summer during Cherry Festival, biking can actually be faster. For you, what are the benefits of biking to work? I feel more connected to the community. I can stop along the ride and see friends or easily meet people downtown for food at The Little Fleet without worrying about parking. Things go by slower, so I can appreciate them more. Any tips for new bike commuters? Don’t make a big deal out of gear. You don’t need a special bike and clothes. I started riding to work on my 15-year-old bike and rode in my work clothes. I still ride in my work clothes, but I did get a new bike recently. Start biking on a nice day and make a pact to ride once a week. What you’ll find is you enjoy it, and it gets easier. What are some common mistakes drivers and bikers make when sharing the road? Be aware of your surroundings. There are lots of distractions in a car, and as a biker, you have to watch drivers and anticipate what they’re going to do like open their door or turn in front of you. Regarding bikers; bikes are considered a vehicle and you have to wait in line just like cars and yield to pedestrians. Traverse City is very bike friendly. There’s room for improvement like anywhere, but as long as I plan my route, there’s a bike lane just about everywhere I go. I feel comfortable taking my kids when I run errands. Ever wanted to run a marathon? These races in Northern Michigan offer some of the most beautiful courses in the nation—at least we think so!